- FrancesCassandra: UK fashion, beauty and lifestyle blog. : Review: LUSH Amandopondo Bubble Bar. I wanted to get a more positive post up today to restore the happy mood of my blog after my previous, slightly more negative post from earlier. I decided to have a Friday night pamper session last night, so I had a nice, hot bath accompanied by the Amandopondo bubble bar I purchased from Lush. The Amandopondo bubble bar is roughly the same shape and size of a jam donut. 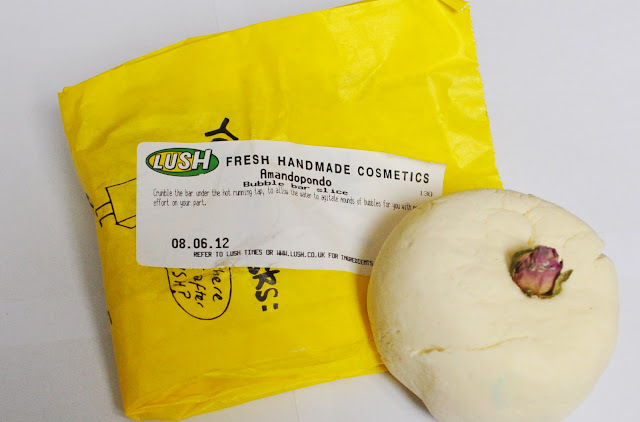 Did you know that Amandopondo means "I am defeated", and this bubble bar was named after somebody copied Lush's products and then tried to sue them for stealing his ideas? Fun fact of the day for you! The bubble bar has a strong rose and lemon smell that is very comforting yet refreshing. I am not normally a fan of lemon/citrus fragrances but the rose counter balanced it well and I really like it. Fittingly, there is a little dried rose bud in the middle which I think is a lovely touch. 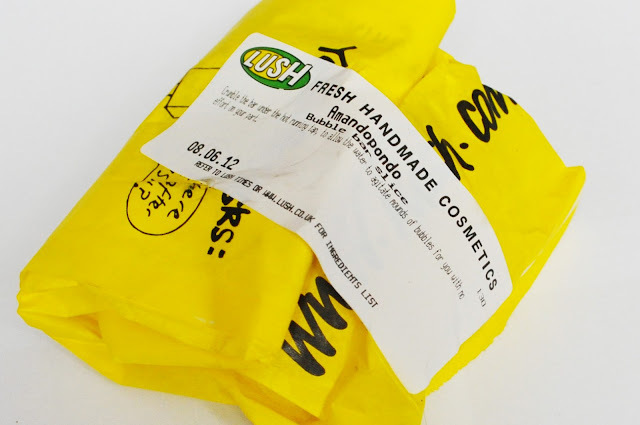 Lush says that this bubble bar was made with the idea of forgiveness in mind, and would be a lovely little gift for somebody to say "sorry". I agree that this looks and smells really pretty, and would make a nice little present. I didn't bother to take photographs of the bubble bar after I crumbled it in to my bath water as it didn't change the appearance of the water or anything, it just produced a nice pile of fluffy bubbles. I found that half of the bar was enough to get a generous amount of bubbles. I could still detect the uplifting smell of roses and lemon but it wasn't quite as overpowering as it was when smelling the solid bar which was perfect, and it made the water silky smooth and very moisturising. I would recommend this bubble bar if you are not a fan of the sweeter scented bubble bars such as Creamy Candy or you just fancy a change, like I did. Have you tried this bubble bar? Which is your favourite bubble bar from Lush? Looks so nice! I've actually never tried a Lush product, though! Wow! I love Lush and that looks amazing! Super glad to be following u, just read your urban decay piece, totally true, can't believe they're now not cruelty free, same with MAC! I loooove LUSH!!! We have a few stores in Germany now too! Sounds wonderful. I have to admit I am still a complete Lush ameteur with only a handful of Lush experiences. I do like the controversial name and lemony-ness. Must try! I think Rose would be such a lovely counter to the lemon - stop it being so zingy and overpowering? I love the look of this I desperately need to get myself to lush and stock up for some treats! I love the Lush bubble bars but unfortunately out here they cost a small fortune. I guess because its all imported?! The cheapest one they sell is over a fiver, which just for a bath is pretty pricey I think. I'd pay it once in a while for a treat if I didn't know it was about half the price in England! That just bugs me, haha! I work for LUSH and absolutely adore the bubble bars over the ballistics. Although they can be slightly more expensive, you can half the bubble bar so that you can use it in 2 baths to get your moneys worth whereas the ballistics are more a of a 'one time wonder'. I love lush bath bars! Amandopondo looks wonderful enough to try.